I have learned a lot about myself since moving in May and have grown more than I ever thought possible. Everyone has always said life and love were a matter of timing, but I never really understood. I always thought it was just one of those clichés people relied on to make themselves feel better about failed attempts and lost loves. Well I guess it's true after all. Once I really began to follow my heart, everything seemed to fall in to place- creatively, emotionally and romantically. In the beginning of July I met Everett and feel luckier, happier and more balanced in this relationship than ever before. I can actually talk to him, about anything and everything and we laugh non-stop. V loves him too and his dog! To prevent myself from rambling on and on... I will stop here and tell you about our weekend. The weekend- I accompanied E to a wedding in Lake Placid (for which I made the dress I was wearing). Neither of us had ever been before and it took our breath away. The air was crisp and clean and the views were spectacular. Our hotel was right on Mirror lake- it was so stunning. 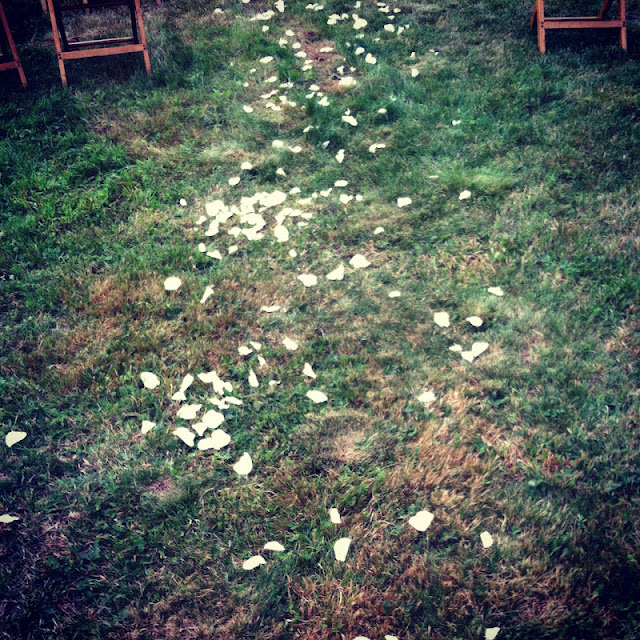 The wedding was so beautiful, simplistic and classy- the ceremony was held at John Brown's Farm and was so sweet. There was a photo booth at the reception with crates of costumes- E and I had a great time- as these photos will show! His glasses say "her's"- how cute!! We loved Lake Placid and our little romantic weekend get-away! We are both very much looking forward to going again very soon. If you get a chance to go to L.P. I suggest you do! How enchanting! You and Everett looked beautiful! and the wedding site looked so sweet! I love it! !